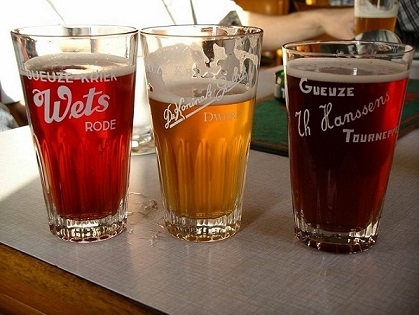 This six day Tour is our classic tour exploring the world's most complex beers, the lambic beers of the Zenne Valley, west of Brussels. It is guided by Siobhan McGinn, co-writer with her husband Podge and Tim Webb of the book LambicLand (2004, 2010). Siobhan's expertise in Belgium's quirky spontaneous fermented beers goes back over 25 years and she will take you to the best lambic cafes in LambicLand to sample this unique beer style. This tour co-incides with the bi-annual lambic brewer/blender open days, the Toer de Geuze. Over six days we will endeavour to visit all of LambicLand's spontaneous beer brewers and blenders, with the exception of Girardin who do not like their lambic disturbed by visitors (!) and Cantillon in Brussels who do not take part in the Toer de Geuze. Thirsty work at Cafe In de Welkom, Dworp. 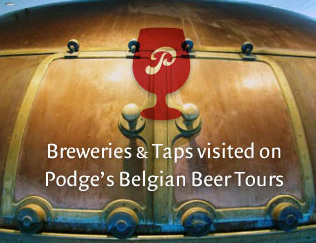 This Tour is based at the excellent four star Hotel Keizershof in the centre of Aalst, a great base for exploring LambicLand, as you can see in Podge's Aalst Bar Guide. Why not join us on Tour? To secure a place please send Siobhan an email or call her on +44 (0)1245 354677. Very early! Coach pick up at Galloways Depot, Denters Hill, Mendlesham, Suffolk, IP14 5RR. 06.15hr Coach pick up at The Woolpack, Mildmay Road, Chelmsford CM2 0DN. 07.00hr Coach pick up at BP Garage (formerly Esso), 474 Princes Road, Dartford, Kent, DA1 1YT. 07.45hr Coach pick up at Premier Inn, Eureka Leisure Park, Rutherford Road, Ashford TN25 4BN. 08.00hr Coach pick up at Stop24 J11 M20 near Folkestone Kent CT21 4BL. 09.20hr Eurotunnel Train crossing from Folkestone. 12.30hr Our first stop is at the beautiful restaurant-bar Au Nouveau Saint Eloi in Watou. This lovely rural café sports a beer card of 150 choices including a fair few lambics if you want to get in the mood. Here we will have our first group meal and a crack at their ye olde Flemish pub games which usually involve throwing things. 15.00hr Leave Au Nouveau Saint Eloi in Watou. 16.00hr Arrive at Eva's Grand Cafe in Bissegem. This cafe is in a converted old station building one stop out of Kortrijk. They have a great beer list of 65-strong, and excellent on West Flemish breweries and Walloonian beers and Lambics. They stock no international brands. 18.00hr Leave Eva's Grand Cafe. 19.00hr Arrive in Aalst and make our way to the centrally located luxury four star Hotel Keizershof. 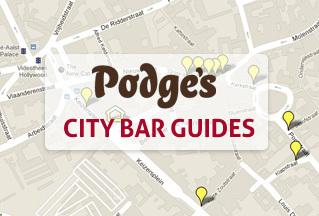 Travellers have the evening free to explore the cafes, bars and restaurants of Aalst armed with Podge’s Aalst Bar Guide and Map*. The magic cooling of lambic to capture airborne wild yeasts, a beer 'in love with the wind'. 10.15hr A brewery visit to the very special Glazen Toren brewery in Erpe-Mere run by the legendary Jef Van den Steen. Podge and I met Jef years ago when he was still a maths teacher and dreamed of brewing. The brewery opened in his house in 2004 and we were there too! 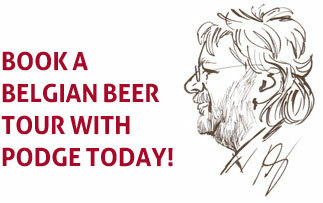 His beers are fabulous and tasty and of course Jef is also an accomplished writer, beer and brewery historian. 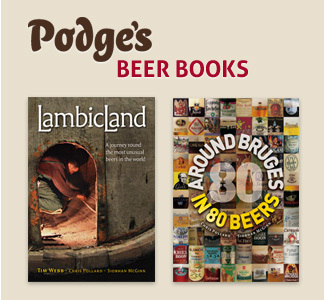 Jef wrote the wonderful book Geuze & Kriek: The Secret of Lambic Beer (2012) which is in English and is of course only bettered by the slim volume written by Podge and I entitled LambicLand: A Journey Round the Most Unusual Beers in the World (2004, 2010). I will always remember many years ago Jef giving us a tutored beer tasting in a bar in Zottegem in a crashing thunderstorm, when, I recall, he paired Kriek beer with blue cheese, and it was great! 12.00hr Leave Glazen Toren Brewery. 14.30hr Lunch at the classic lambic bar and restaurant De Heeren van Liedekercke in Denderleeuw where Joost and his family have been selling lambic beers for some years, long before the modern resurgence of their popularity. 16.45hr Leave Heeren Van Liedekercke. 17.00hr Arrive at Biercinema in Haaltert. This is a beer café on the site of the old village cinema “De Warande”. They have a whopping beer card of 150 choices. With over 24 proper lambic beers and loads of others from small breweries. 19.00hr Arrive back in the friendly city of Aalst for a crack at its great beer cafes and restaurants. Wooden casks of Boon lambic beer. 10.30hr We have arranged a visit Armand DeBelder's new venture, the 3Fonteinen Lambic O droom in Lot. In 2016 legendary brewer and blender Armand Debelder and his partners converted a former ice cream warehouse in Lot into a new complex designed to centralise the breweries operations and allow visitors to see the end-to-end processes of Lambic beer making. As we will see, it houses a coolship, blending facilities, barrel-ageing rooms, a bottling plant, a bar, tasting rooms and a shop. We’ll have a taste of Armand’s lambic here*. We visited in 2017 and hopefully his then newly planted Schaarbeek cherry orchard is coming along well. Though 3Fonteinen Schaerbeekse Kriek is a premium price, it is counted by many as one of the world's great beers and a true taste of the terroir. 14.15hr We proceed to the brilliant Grill-Restaurant Boelekewis in Dworp for something to eat and a beer or two from their impressive menu of Lambic beers. 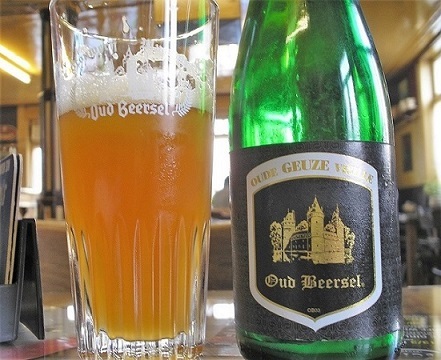 16.00hr We pay a visit to the Oud Beersel Geuzestekerij in Beersel for a guided tour* around the old brewery museum, the current blendery and a special tasting* in their superb suite of comfy modern tasting rooms. They are the creators of Oude Geuze and Oude Kriek and the newer mixed fermentation Bzart sparkling range. 18.300hr Arrive back in the friendly city of Aalst for a crack at its great beer cafes and restaurants. 10.00hr After a leisurely breakfast* our coach leaves the hotel. 10.30hr We make a special visit to a café that is opening just for us - the famed In de Verzekering Tegen de Grote Dorst (The Insurance Against Thirst) in Eizeringen run by the Paneels family who re-opened this gorgeous café in recent years and have an unrivalled selection of lambics, geuzes and krieks. They have a selection of vintage beers and hopefully they still have some Eylenbosch left from the closed lambic brewery down the road. They may even have beers from new lambic blender, Raf Souvereyns under the name Methode Goat (previously known as Bokkereyder) who has worked out of Limburg Province since 2013, far from the Zenne valley. You'll recognise his bottles from the logo of a goat hiding behind a tree. 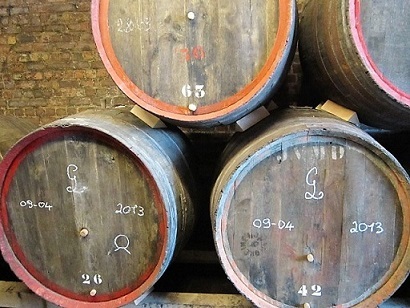 He has around 100 wine oak casks and blends lambic worts from De Troch, Girardin and Lindemans. Raf has blended dozens of beers, picking cherries for his kriek lambic and using his neighbours peaches. He has also made a blend called Druiven using local grapes. This is a superb addition to the lambic-cafe scene usually open only on a Sunday. 12.00hr Timmermans in Itterbeek. This is the oldest lambic brewery still working and dates from 1702 and again there are opportunities to sample their many lambic-based beers. 13.00hr Leave Brouwerij Timmermans, Itterbeek. 13.15hr Arrive at Belgoo Brewery in for a brewery visit and tasting. Jo Van Aert runs a great little brewery in the heart of the Payottenland and his brews include some nice organic saison beer and he does have some lambic which he has brewed in casks within cooled containers in his yard. New (lambic)kids on the block Lambiek Fabriek have their lambic coolship also in the yard, 12 feet up under a makeshift roof. Perhaps we can see it at least the underside as a ladder is necessary for a full view. Lambiek Fabriek started with two local lads who wanted to make geuze. They started in 2016 and now have three years of their own brewed lambic (brewed here at Belgoo) to blend with and they make Brett-Elle geuze and the newer Fontan-Elle. Ram skull on bottle label. Very distinctive. I'll tell you more when we get there. 14.45hr We will have lunch at the world famous 3Fonteinen Restaurant in the traditional heartland lambic town, Beersel. Here we will have our pre-booked beer cuisine lunch and a chance to sample a great selection of lambic beers 3Fonteinen brewery but best go for the yong or young lambic on draught from 3Fonteinen which is around one year old, or as the brewers prefer to say 'has seen one summer'. 17.00hr Leave 3Fonteinen Restaurant in Beersel. 17.15hr We pay a visit to the giant and ever-expanding Lindemans Brewery in Vlezenbeek. 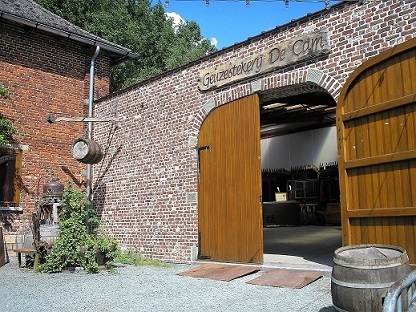 Now being run by the 7th generation, they started as a barley farm which made lambic on the side during the winter to employ workers year-round. By the 1930’s, brewing was so successful, they gave up farming. Go for the Oude Gueuze Cuvée René and Oude Kriek Cuvée René if you want the real deal. 18.15hr Leave Lindemans Brewery in Vlezenbeek. 18.30hr Visit De Troch at Wambeek. This is a small, attractive lambic brewery housed in a still-recognizable farm around three sides of a square. It has a very old chimney, square in profile, pre-dating the more ubiquitous round brewery chimney. Most of the production of this brewery goes into sweet commercial beers, but the real lambic they make is superb. 19.30hr Leave De Troch Brewery in Wambeek. 19.45hrish Arrive back in the friendly city of Aalst for a crack at its great beer cafes and restaurants. 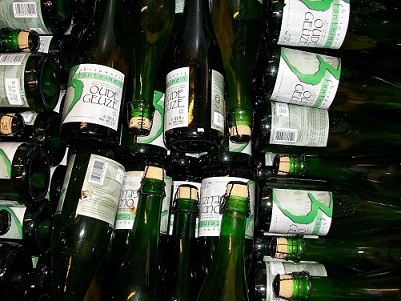 3Fonteinen Oude Geuze Bottles 37.5cl having a rest. 10.00hr After a leisurely breakfast* we set off by coach for the biennial Toer de Geuze. Over the years the Toer de Geuze has attracted more and more people and each venue gets quite crowded with people enjoying these open days and beers. We hope to have about an hour and a half at each venue and will announce exact times to be back on the bus on the day. At most of the venues you can buy a snack to eat on the hoof. For each Toer de Geuze all of the members of HORAL contribute towards a special Oude Geuze beer brewed for the occasion and you should see bottles for sale at each of the venues of HORAL Mega Blend 2019. As a special experience for travellers, Siobhan will open some very special bottles from her and Podge's cellar for everyone to taste which is the HORAL Megablend 2009, the first ever Megablend produced which is now 20 years old. 10.30hr Mort Subite in Kobbegem. The brewery was sold to the Alken-Maes group in 1989 (taken over by Scottish & Newcastle in 2000, who were taken over by Carlsberg and Heineken in 2007). Around this time the brewery began to suffer from numerous infections. 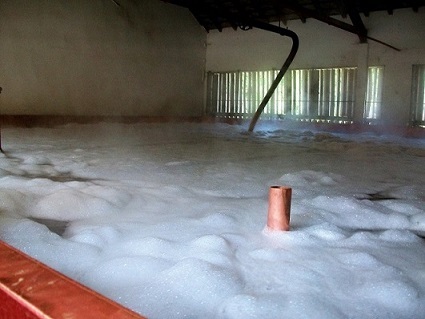 It was discovered that the old coolship was too small and too deep to handle the large amount of wort going through it. So to help spread the load half the wort was pumped instead into a stainless steel tank which was then filled with the local air. An behold, this beer was found to have just as much wild yeast as the stuff in the coolship. The coolship was retired and so Morte Subite can be brewed all year not just 'in season'. Scottish & Newcastle invested heavily in the brewery and fortunately a wee bit of production goes to Oude kriek (from 2007) followed by Oude Geuze. They are bottled at Boon and Morte subite are the only lambic brewer to use wholly Belgian Kriek/cherries. 11.30hr Leave Mort Subite Brewery in Kobbegem. 12.00hr Hanssens in Dworp. There will be a chance to try rare beers from this blender including Hanssens Lambic Cassis, Hanssens Lambic Raspberry and Hanssens Kriek Lambic Schaerbeekse (in limited quantities) for tastings and purchases. 13.15hr Leave Hanssens in Dworp. 13.30hr We proceed to probably the biggest lambic, Geuze and Kriek producer, Boon Brewery in Lembeek where you can see the new brewery which Frank and his son Karel have built. We can have a taste of a beer or two here. 14.30hr Leave Boon Brewery in Lembeek. 14.45hr Arrive at the most southerly member of the traditional geuze and kriek makers, Tilquin in Bierghes (Rebecq). 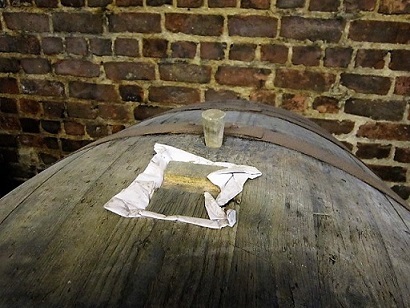 Pierre Tilquin holds a two-day open brewery event on the weekend of the Toer de Geuze, where you can have a tour of his blendery and barrel rooms. His beers will be for sale at the bar and you can buy bottles to take away at the shop. They have food stalls and a bouncy castle. Pierre may have available Gueuze à l'ancienne and Gueuze on draft plus his Quetsche à l'ancienne a beer with Alsatian Purple Plums on lambic, refermented in the bottle. Look out also for the Mûre à l'ancienne, a blackberry lambic refermented in the bottle. 15.45hr Leave Tilquin in Bierghes. 16.00hr De Cam in Gooik. This is a tiny blender and is a good one to pick if you want a mini tour. By the way, Karel the blender is passionate about lambic beer, almost out-doing Armand DeBelder in his enthusiasm for this beer and I would say that his Raspberry Lambic was the best beer I have ever tasted, a few years ago in the yard at De Cam. 18.00hrish Arrive back in Aalst for a free evening. De Cam Geuze & Kriek Blenders, Gooik. 10.00hr After breakfast* check out of hotel. Coach leaves for our last day. 10.45hr We will pay a visit to Bierhalle Deconinck beer warehouse in Vichte. This is a top beer warehouse with a choice of 1400 beers so you can stock up on beers to take home, particularly any special lambics you didn't get to try on Tour (an unlikely event). 12.00hr Call in at Verzet Brewery in Anzegem for a brewery tour* and a beer tasting* of three beers from their excellent range. These young guys go from strength to strength in their new brewery and are doing a great job brewing fresh interesting beers (one with young oak leaves) and their Flemish Red/Browns are great additions to this revived West Flanders staple. 14.00hr Our last stop is a comfortable, leisurely visit to a great beer cafe and restaurant in Geluwe, 't Smiske (The smithy). We'll have a group meal here and a crack at their substantial beer card of 140 choices. 19.36hr Leave Calais on Eurotunnel train crossing. 19.45hr Coach drop Stop24 J11 M20, Kent CT21 4BL. 20.00hr Coach drop Premier Inn, Eureka Leisure Park, Rutherford Rd, Ashford TN25 4BN. 20.45hr Coach drop Dartford Railway Station DA1 1BP. 21.30hr Coach drop off The Woolpack, Mildmay Road, Chelmsford CM2 0DN. 21.40hr Coach drop off at Premier Inn Victoria Road, Chelmsford CM1 1NY. 22.45hr Coach reaches destination Galloways depot, Denters Hill, Mendlesham, Suffolk, IP14 5RR. 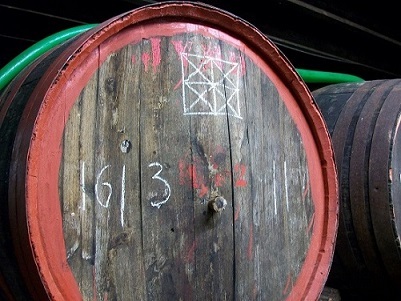 Wood casks of lambic beer bearing the Lindemans chalk mark. If you have any questions or would like to be added to the interested list please send an email or call on +44 (0)1245 354677.